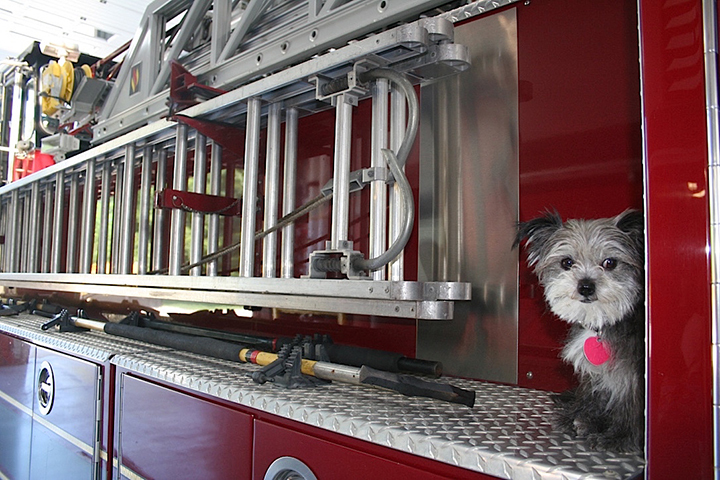 Carmel’s fire department headquarters recently had a 6-pound visitor — Toto. Not only did he get a tour of the station, he also ended up on the lap of Chief David Haboush, where he heard stories from the past. Toto learned that the fire station was home to the mayor’s office until 1990, when it moved to its current location at Carmel’s Civic Square. “We shared the same fridge with Mayor ‘Dottie’ Hancock,” Battalion Chief Gary Brandt said. “One day we discovered a large (unlabeled) ham in the fridge, and you can guess what happened.” It sounded like the mayor was a good sport about losing her ham to hungry fire fighters. (Photos by Julie Osborne) Learn more about Toto and Oz’s adventures on their blog: JulieOsborne.com.